a) Rationalize the relative stabilities of the cation species below. 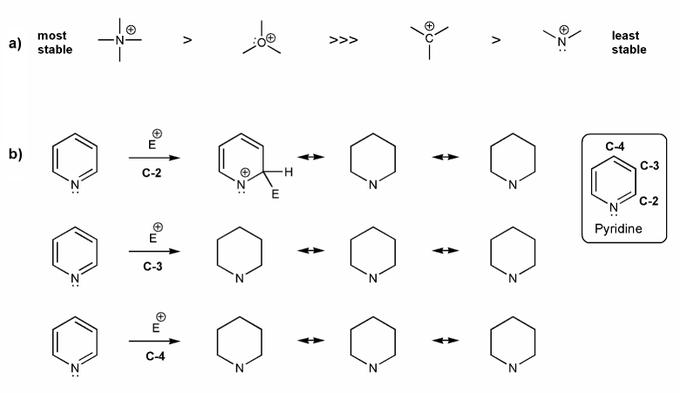 b) Pyridine undergoes eletrophilic substitution at C-3. Let's compare the resonance forms of EAS carbocation intermediates to see why this is the case. Consider part a) in your explanation. a) The species on the left are much more stable than the species on the right because they have complete octets. Nitrogen is less electronegative than oxygen, so a positive nitrogen (with a full octect) is more stable than a positive oxygen; oxygen is electronegative and so doesn't "like" being positive (have low electron density). The carbocation and the "nitrocation" are both very unstable because they only have 6 valence electrons. Because nitrogen is more electronegative than carbon, the nitrocation is even less stable than the carbocation, because its worse at handling a positive charge. 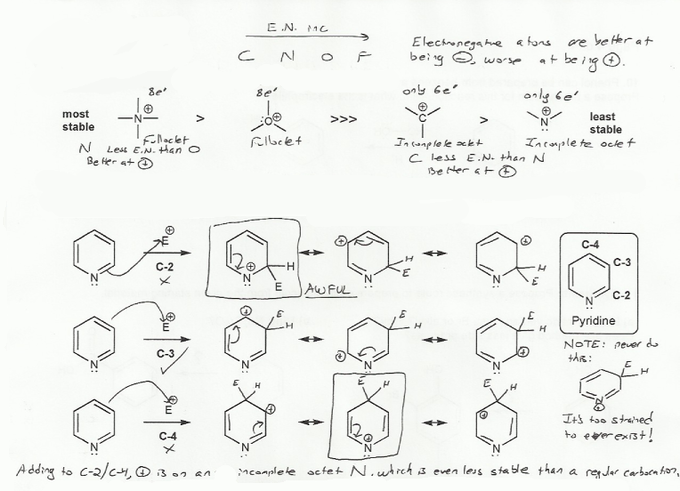 b) The cation intermediates that result from substitution at C-3 only contain carbocations, while the intermdiates from C-2 or C-4 substitution contain a "nitrocation," which is less stable than a regular carbocation, and so are not favored. So pyridine undergoes EAS reactions at C-3. One more note: For substitution at C-2 and C-4, it's tempting to draw a resonance form where the positive charge is on the nitrogen, which is flanked by two double bonds. But this cyclic compound is too strained to exist, and so doesn't contribute to this analysis. MendelSet practice problem # 593 submitted by Matt on July 9, 2011.